How Car Insurance Works in India? 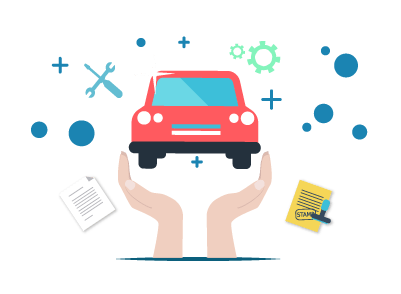 How Car Insurance Works in India? Car insurance is an agreement between the owner of the car and the insurance company; where the car owner agrees to pay certain premium amount with a promise by the insurance company to cover for the loss, repair or damage caused to the insured vehicle in case of accident or mishap. It is mandatory under the law of Motor Vehicle Act of 1988, to own a vehicle insurance. Car insurance covers various damages that may occur to you or the owner or third party. It also comes with add-on covers that enhance your basic policy by giving you an extensive cover that cater your needs. If you are buying a new car, the car dealers will have tie-ups with various insurance providers. So it is easy for you to buy an insurance along with the purchase of the car. Comprehensive policy: This is a standard policy that provides an extensive coverage under various situations for the policyholder. Also known as ‘other than collision’ cover, this plan covers third-party liabilities due to body injuries and/or accidental death/property damage, own liabilities arising out of personal losses and/or property damage from natural calamities and/or man-made calamities. The premium for this plan is high due to the extensive insurance coverage the plan provides. Insurers usually provide a number of add-ons that you can opt for under the comprehensive plan. Few add-ons are zero-depreciation, engine cover, Key replacement, roadside assistance, anti-theft device, etc. Third-party Liability cover: Also known as third-party insurance, this plan provides cover against all the legal liabilities that arises due to damages or injuries caused to a third-party person or property by the insured vehicle. Personal losses covered under this plan include accidental death, body injuries, permanent disability, etc. This insurance cover can be availed at a low premium as it covers only third-party liabilities. This cover allows you to raise a claim under the ‘no-fault liability claims’ category. Here, you are allowed to raise the claim without having to provide proof that suggests your negligence caused the accident. Sometimes insurers provide personal injury protection cover as an add-on for this insurance policy. Loss or damage caused to the vehicle due to an accident, natural calamities, civil protests, riots, earthquake, flood, etc. It covers bodily injuries occurred to the driver or owner of the insured vehicle if the vehicle was in a mishap or accident. Legal liabilities arising out of third-party person or property damage by the insured vehicle. If the owner of the insured vehicle has passed away in an accident, then the nominee will be liable to receive the death benefit as mentioned in the policy. Personal accident cover for up to Rs.2 lakh can be availed or claimed if the owner of the insured vehicle has suffered a permanent disability or death. Usual ageing with wear and tear. If the owner do not have a driving license, he/she will not be eligible for insurance. Insured Declared Value: Commonly known as ‘market value’, it is the value calculated after deducting depreciation value of the vehicle. The value of the policy will be based on the IDV, the value is calculated on manufacturer’s showroom listing price. Bike model: Year of manufacturing, engine capacity, model, etc. are vital components in determining the premium amount of the car insurance policy. If your vehicle is new the premium amount will be slightly lower when compared to the older vehicles. Location: For cities like Delhi, Bengaluru, etc. premium amount is higher for these cities when compared to non-metropolitan cities. Driver: The age and profession of the owner of the vehicle is also taken into account while calculating the premium. If the insured vehicle is in any mishap or accident, he/she should call the insurance company and mention about the incident in detail. If there is no fault of the insured vehicle, then he or she should note down the details of the other vehicle and mention the same to the insurance vehicle. File an FIR with the nearest police station of that jurisdiction. File the claim with the insurance company and keep the reference number for further process. You can also make cashless claim by repairing the vehicle or contact the nearest hospital for medical emergencies, with the network of garages or hospitals that the insurance company has a tie-up with. You can also claim for reimbursements if you have already borne the expenses which is covered under the policy, with the insurance company with relevant documents as mentioned in the policy.